To a novice, this topic seems to be a simple task. Take some covering material, two boards and an inlay strip. Apply an adhesive onto the covering material. Place the boards and inlay into an exact position, turn-in all four edges and the case for a hardcover binding is finished. Yes, this sounds simple but there is much more to it. Perhaps the most difficult task to accomplish is the right fit. This alone would justify an article. While being employed in the industry before the age of computers, this writer had to specify the dimensions for all kinds of book cases. These included edition bindings, side-sewn textbooks, limp style, flexible Bible covers, padded covers and many others. In short, a very complex task. During Drupa 2008, Kolbus did show us a new linear casemaking machine which produced 100 book cases a minute. Impressive and amazing technology. The engineers who now head an all-new casemaking machinery enterprise near this writer's home in New Hampshire, GP2 Technology, have produced in the past (20+ years ago) an American case making machine that did cycle at 120 book cases a minute! As the industry changed, they founded an all new company and now concentrate on the short-run, on-demand and photo book markets. Best of all, they have come up with some unique case-making machinery designs. During the last two Drupa's, they were recognized by bookbinding experts from all over the World. Let us now discuss in short some of the various kinds of book cases. The majority of these cases are produced at relative high speeds on automatic case making machines. There are reciprocal double head, and linear designs. The covering materials are fed automatically and receive a very thin, high quality protein glue. The two boards and the inlay must be appropriately spaced, all in accordance to the method of binding used. An adhesive bound book block requires slightly more space in the joints than a sewn binding. This is to absorb the forces exerted onto the first and last relative fragile leaves. A square back hardcover binding with a board strip as an inlay requires almost double the space in the joint/hinge areas. 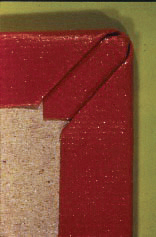 Children books mostly feature a board strip on the spine. Many case making machines have a feature, where we feed a single piece of board and then slit it into two panels and a spine strip. Some board suppliers offer pre-assembled board structures called “Unitized Boards.” These are pre-assembled components of boards, often reinforced with a gauze in the joint areas. Another popular task in case making are the so-called three-piece covers where we have different materials on the spine and panels. There are many different options available to produce such covers. Some linear case making machines take the covering materials off a roll. The web receives a thin coat of adhesive. The three different rolls are combined. The cover boards and the inlay are placed-down onto the continuous web. The corners are cut, the sides are turned-in. The last procedure is to cut the web and turn-in head and tail. 40 years ago, when large quantities were the norm, we, as a highly specialized book manufacturer for reprints and short runs sometimes had to produce only 150 books. We, had to use some ingenuity to cope with such small editions, as each one of the covers were using different covering materials. (Printed cover materials were virtually unknown) We did sort the orders by trim size. Changing the dimension of the case making machine only in the width saved a lot of change-over time. At Drupa, they introduced a new cost effective model called the EC-3 which was most successfully received by small On-Demand and Photo Book establishments. “Just the right thing as the doctor ordered” said one of my colleagues. The SC-2 Autocase received further improvements and represents the latest generation of leading technology for “one off” and on-demand casemaking. Prior to Drupa 2004, this writer, being so close to the factory, had information on GP2's top model, the Autocase AC 20. GP2 Technology is also a leader with library corners. For those readers not familiar with it, the corners of the covering material are not cut, they are first turned-in. Thereafter, the edges are turned-in. This results into a slightly rounded corner. Librarians insist on such a technique as they believe, such corners offer better abrasion resistance. There are of course, as stated earlier, many other cover structures such as flexible covers or some new, economical case making techniques where no boards are used. We will cover those in a future article.